Great Seal appointed for the Government of the Realm after death of King Alexander III. 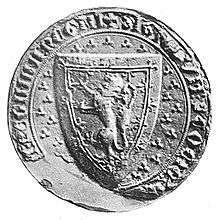 The Guardians of Scotland were the de facto heads of state of Scotland during the First Interregnum of 1290–1292, and the Second Interregnum of 1296–1306. During the many years of minority in Scotland's subsequent history, there were many guardians of Scotland and the post was a significant constitutional feature in the course of development for politics in the country. "... Guillaume de Seint Andreu et Robert de Glasgu evesques, Johan Comyn et James Seneschal de Escoce, gardeins du reaume de Escoce..."
English translation: "William [Fraser] of St Andrews and Robert [Wishart] of Glasgow bishops, John Comyn and James the Steward of Scotland, guardians of the kingdom of Scotland". Sir Thomas Randolph, 1st Earl of Moray (1329–1332), appointed by the Act of Settlement of 1318. Sir Andrew Moray of Bothwell (1332–1333) until captured by the English. Robert the Steward, nephew (older in years) to David and future king of Scotland. Robert was guardian on four occasions, sometimes jointly, and latterly twice during the eleven years of the king's enforced absence as a prisoner in England after the Battle of Neville's Cross (1345–1357). He used these years to build a large power base in the country, especially north of the Forth. ↑ Barrow, G. W. S. (2005). Robert Bruce and the community of the realm of Scotland. Edinburgh University Press. p. 38. ISBN 9780748620227. Retrieved 2009-10-14. ↑ "Margaret: Manuscript - 1290, 14 March, Birgham - Parliamentary Records - Letters: confirmation of the treaty of Salisbury" (in Old French and English). Records of the Parliaments of Scotland to 1707, University of St Andrews. Retrieved 2009-10-03. ↑ G. W. S. Barrow, Robert Bruce and the Community of the Realm of Scotland (2005) p. 189. Mack, James Logan (1926). The Border Line. Pub. Oliver & Boyd. pp. 317–322. McNaught, Duncan (1912). Kilmaurs Parish and Burgh. Pub. A.Gardner. p. 9.